(Similar information to the above, but with more details about the finds, also) 'A bronze celt was found in the garden at the same time, 4 in long and 2 1/2 in broad at the edge, with a socket to admit a handle, and a lateral loop'. Standing Stone and Cemetery, Warriors Rest. At the SE corner of the cottage known as Warriors Rest, 300 yds W of Yarrow Church (RCAHMS 1957, No. 10, NT32NE 9), there is a standing stone measuring 5ft 3 ins in height, 5ft 9 in round the base and 4 ft round the shoulder. The top is pointed. In 1857 a group of eight stone-lined graves was found from 10 to 12 yds S of this stone. (J A Smith 1859) They were built of large slabs, measured from 5ft to 6ft in length, and were oriented E and W. Apart from traces of bone, the only contents of the graves were fragments of a Food Vessel and an Early Bronze Age ring of cannel coal with thin, perforated walls, (J G Callander 1916; V G Childe 1935) this ring and one small fragment of the Food Vessel are now in the National Museum of Antiquities. Close by, a cairn of small round stones enclosed a quantity of partially decomposed bones, while numerous fragments of bones were cast up by the workmen employed in digging the foundations of the cottage. A flint arrow-head and part of a stone hammer (J A Smith 1868) were also found in the same area. and W and lacking grave-goods, are characteristic of Christian and not pagan burials, (J Anderson 1868) and evidence of Christian burials in this area is provided by the inscribed stone (NT32NW 5). It is probable, therefore, that the site has been successively occupied by Bronze Age and Early Christian cemeteries, and that the appearance of the Food Vessel fragments and the ring in the later graves is due to the disturbance of the earlier interments. 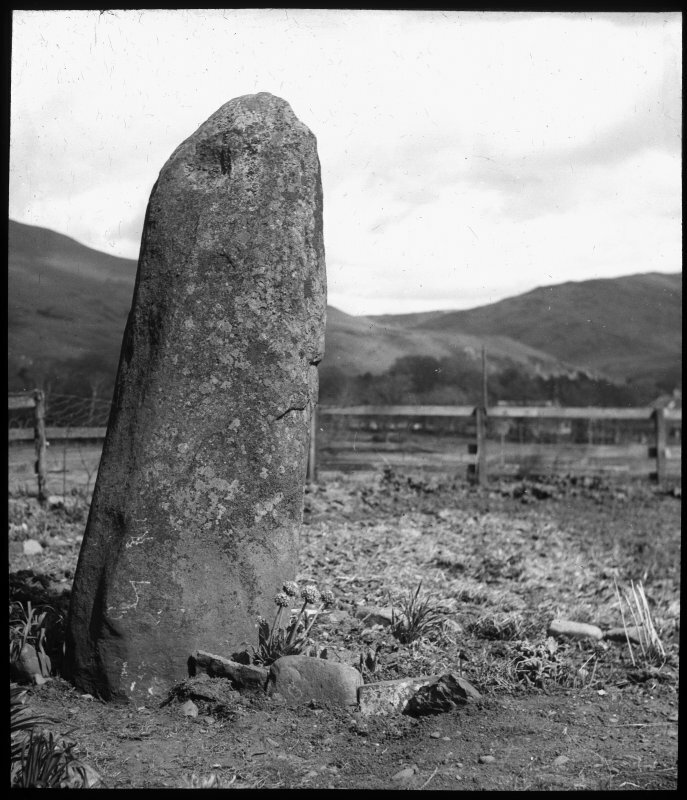 The stone is as described by RCAHMS. There is no evidence of a cairn or graves in the vicinity. See also NT32NE 11. Visited by OS (EGC) 5 June 1962. Coles mistakenly locates Yarrow in the former county of Roxburghshire; his socketed axes Roxburghshire 31 and Selkirkshire 1 are in all probability the same. On the evidence of the coincident descriptions, Annan Street (NT32NE 11) and Warrior's Rest (NT32NE 1) are the same group of finds and monuments, within which the standing stones NT32NE 1 and NT32NE 2 the Yarrow Stone (NT32NW 5) are also situated. Information from RCAHMS (RJCM), 18 April 1990. A site visit to this standing stone (N T32NE 1) was carried out in November 2003. Two previously unreported cup markings were marked on the E side of the stone, each c 20mm in diameter. A geophysical survey was conducted in the field around the Yarrow Stone and the adjacent field to the east in September 2014 by Archaeological Services Durham University. The works comprised geomagnetic survey of approximately 7ha. No features of probable archaeological significance were identified, however, it is possible that some of the anomalies could reflect the remains of ditches or pits. No features have been identified close to the Yarrow Stone, other than drainage ditches for the existing track. The stone may not have been re-erected exactly where it was originally discovered. A probable igneous dyke, and more subtle geological variation, has also been detected. A geophysical survey was conducted around the Glebe Stone and to the west of Warrior’s Rest, Yarrow, near Selkirk, in the Scottish Borders in August, 2015. The works comprised geomagnetic survey of approximately 8.5ha. The works were commissioned by Dr David Petts of Durham University on behalf of Mr Jack McCrory and conducted by Archaeological Services Durham University. Although few features of probable archaeological significance have been detected there are a number of possible ditches and pits. For example, part of a possible rectilinear enclosure ditch has been identified south-east of the Glebe Stone, though the surveys have detected no evidence for any features closer to the stone. Occasional small circular anomalies have been detected across the site (for example in Areas 3 and 9), which could possibly reflect the remains of ring-ditches; these could possibly be associated with former cairns. It is likely that any cairns have been destroyed by the removal of stone, almost certainly to the field walls, and that little or no geophysical trace of them survives in the subsoil. Former ploughing of these fields will also have impacted upon any nearsurface features. Features relating to modern and recent agricultural practices have been identified, including former ploughing, land drains, former dykes and animal feeders. Probable geological and geomorphological variation has been detected across the survey area.